1.5 What’s Up? The Ceiling. Ready to get creative? 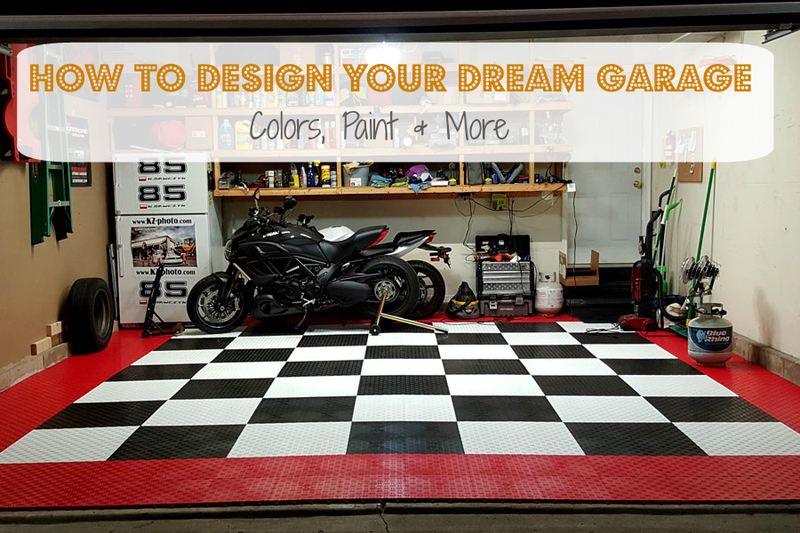 Learn how to design your dream garage using colors, paint and more. 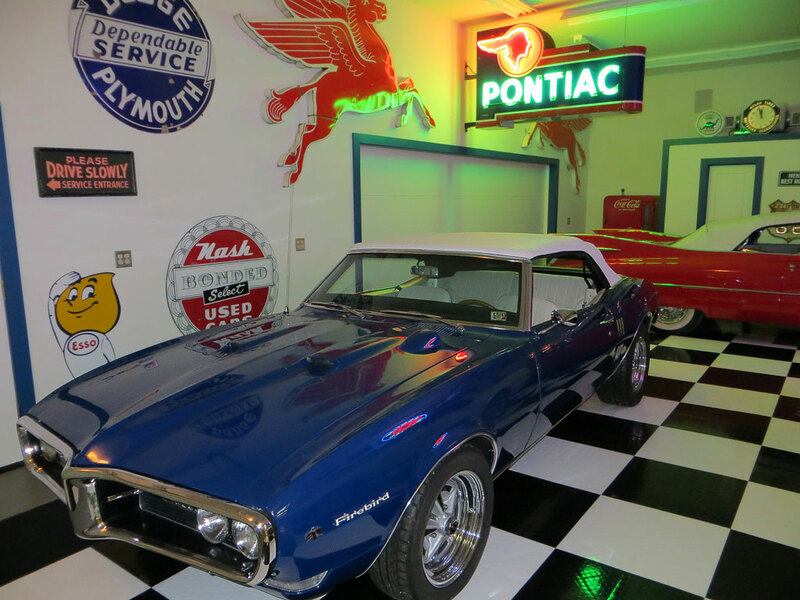 Don’t get stuck with a typical, boring garage. 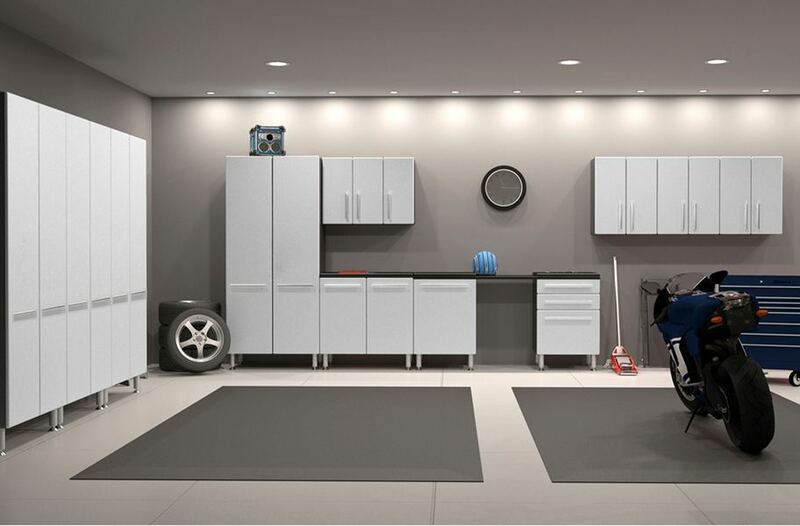 Make your garage extraordinary. 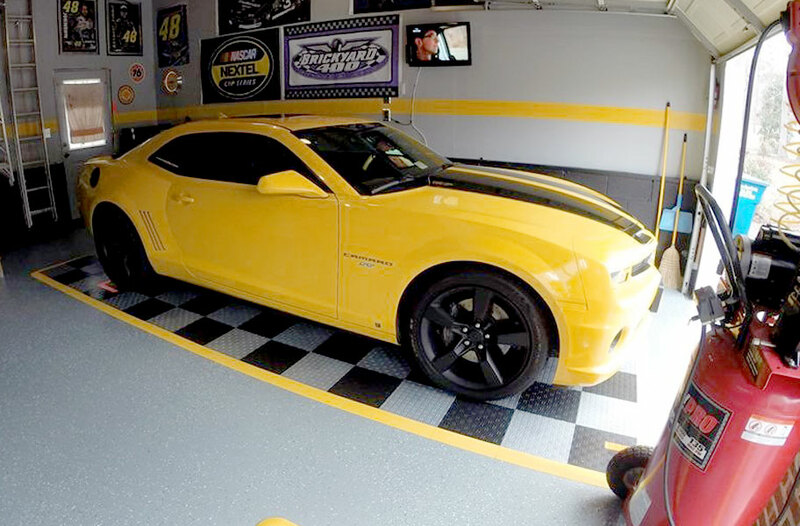 The big picture things are clear – you know how you’ll use your garage and you’ve decided on your theme. Now it’s time to dig a little deeper and think about colors. This is where you will see your vision come to life. As you decide on the color scheme and individual colors in your space, you will begin to see your ideas coming together. It’s really exciting! However, there is a lot to consider and it can quickly become overwhelming. Just follow this step-by-step list on how to choose colors for each item and it will be smooth sailing. Man, if you’re anything like me, this is an intimidating task. I am not the person who magically picks out all my decor and them *boom* everything matches like it’s out of a magazine. Personally, I like to start with my neutral colors. Right now I’m super into grays and bright whites. Those are pretty neutral, yes? They go with just about anything. Then pick out one, maybe two accent colors. You can use a site like this to get palette ideas and make sure everything goes together. 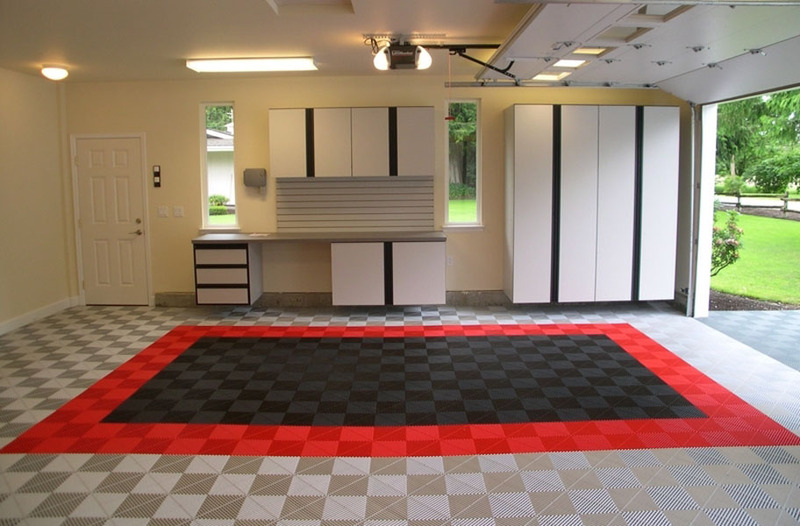 A common garage theme is black, white and red. Black and white are your neutral base and red is your pop or accent color. 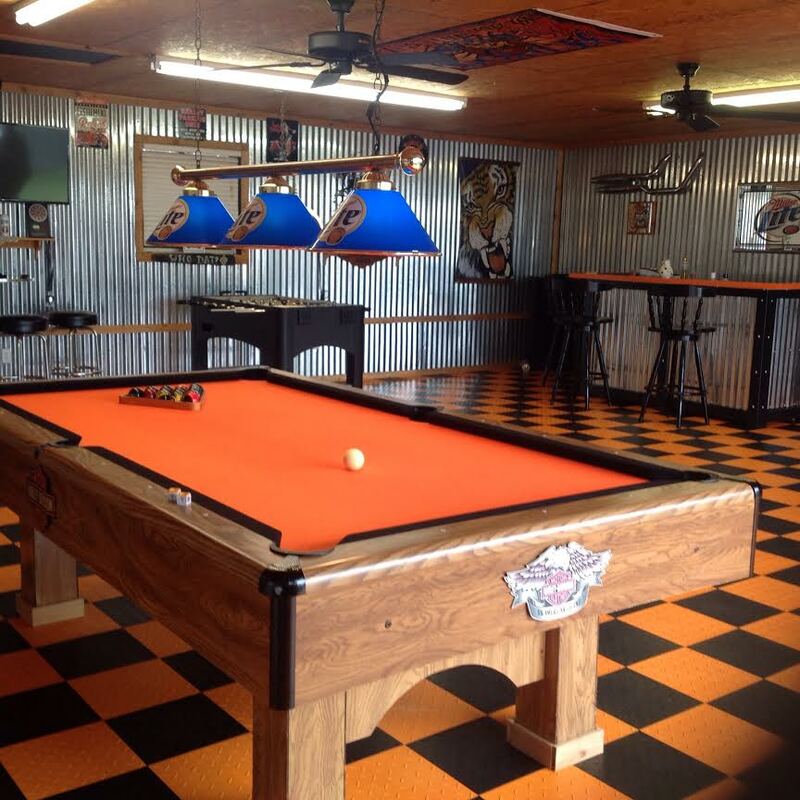 Orange also makes a great accent color in the garage, especially for you Harley lovers. For your floor, you have a few options. 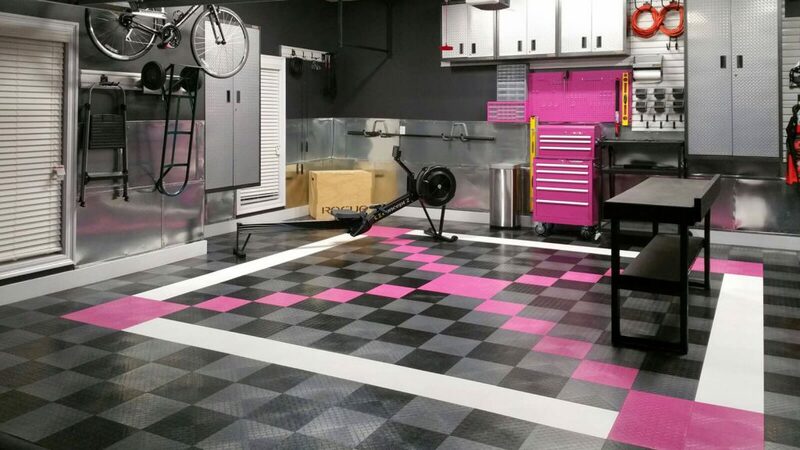 If you’re going with a garage flooring roll, you will probably stick to your neutral color. However, if you choose epoxy, you have the option to stay with the neutral or use your floor as the place to make a splash with your accent color. My favorite option is to create a fun pattern using garage floor tiles. You can combine your neutral color and accent color, either in a checkerboard or other type of pattern. This is also a great opportunity for the classic black and white look, too. If you’re going for a very specific design here, you may have a lot of colors going on. That’s okay! This is why you’re going to choose this part first. It’s much easier to choose paint to match the floor than floor to match the paint. And, of course, don’t forget to check the colors against your vehicle. 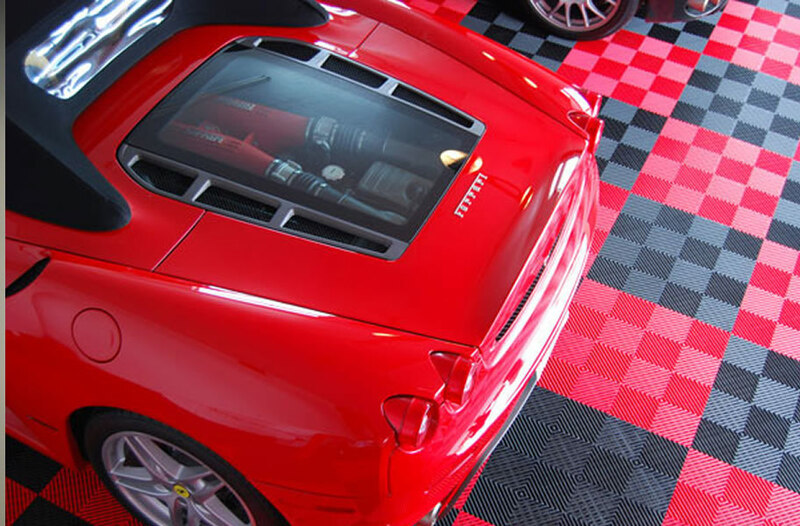 You want to make sure it looks great because you are not buying a new Ferrari just to match your new floor. Once you’ve chosen your floor, hang onto those samples you ordered. You’re going to want to compare them against all your new paint swatches. The first thing I like to do when choosing paint colors is I go to the store and grab literally every single free paper swatch they have that I even remotely think will work. Then, I take them home and put them all up on the wall. Next, eliminate all the ones you hate now that you’re home. Take your floor samples and hold them up against the paint samples to see how they go together. Choose just a few favorites. The actual paint samples (not the paper ones) cost money and it can rack up pretty quickly. Take your favorites and paint a large swatch of each in your garage. Now compare to your floor, car and decor to see which one is best. If you plan on having an accent color or adding a trim color, go through the same process. Just make sure you keep your winning swatch up so you can compare the paint colors against each other. This part is fun. I just recently redid my home and we decided to use the baseboards as a neutral accent color. So…we used gray which still matches with everything, but it’s darker than traditional baseboard and ended up looking like an accent piece. Often, people just go with traditional white baseboards/paneling, but this is a great place to do something a little different. Make sure you keep your basic paint swatch up on the wall so you can try all your baseboard/panel colors up against it. Also, don’t forget to double check how everything looks together – wall, baseboards, floor and car. If you ask me, this is not the place to choose dark, looming colors. Honestly, I am of the opinion that traditional white is the way to go so that your garage doesn’t feel like a cave. However, if you’d like to do something different, go through the same steps with the samples and make sure everything goes together before making a decision. This is the fun part! Now that you know your basic color scheme, you can pick out all kinds of fun stuff to put on the walls and use for decor. If you’re going with a mural, that is a pretty big commitment. Make sure all the colors you’re using and your idea match everything else you’ve chosen so far. You can print out your inspiration and hold it against your swatches and floor samples to make sure. Stickers and wall art are a little easier. You have an idea of what your space will look like and you can use your imagination to see if these things will go. If worst comes to worst, just make sure the items are returnable. Then you don’t have to stress too much about whether they will match. This is one of those things that people forget about. And you really shouldn’t! It’s important to decide how you will light your garage and the look of those lights and lighting fixtures. For example, a 1920s chandelier would not look awesome in a grunge-themed garage. In my opinion, you want lighting fixtures to be subtle and the lights themselves to be clear and look as close to natural light as possible. However, this is one of those areas where you could use lights as an accent. A hot red light over your black car would look pretty sharp. You can even do something crazy like a disco ball if it works with your overall theme. Ready to get started? 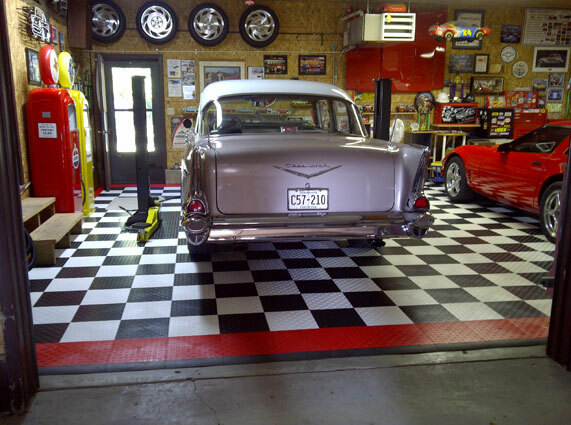 Order your garage flooring samples today. I need some help. I have decided to use tiles and decided on colors(black, red, gunmetal) but could some ideas on how to arrange and how many of each to order. Does your company provide that assistance? I will have one of our sales reps reach out to you and help you figure out exactly how much of everything you need. Can’t wait to see how the garage turns out!